Teen-aged Internet bully Ivy Lake fell off a cliff and few people cared ... except her mentally-challenged eighteen-year-old step-brother, Tommy. He loved her in spite of her cruelty. He's distraught and doesn't understand why his blended family is falling apart. After a year, the police still have no answers: Ivy could have jumped, could have been pushed, or it could have been an accident. With too many suspects and not enough evidence, the investigation has grown cold. Tommy thinks that if someone can figure out what happened to his step-sister, everything will go back to normal, so he writes to investigative reporter Maxine Revere. This isn’t the type of case Max normally takes on, but the heartbreak and simple honesty in Tommy's letter pulls her in. She travels to Corte Madera, California, with her assistant David Kane and is at first pleased that the police are cooperative. But the more Max learns about Tommy and his dysfunctional family, the more she thinks she’s taken on an impossible task: this may be the one case she can’t solve. If Ivy was murdered, it was exceptionally well-planned and that kind of killer could be hiding in plain sight ... planning the next act of violence. Max believes the truth is always better than lies, that the truth is the only thing that matters to gain justice for victims and their families. But for the first time, she wonders if this time, the truth will kill. Poisonous by Allison Brennan is a 2016 Minotaur publication. This is a complex crime novel, very compelling, emotional, sad, and quite disturbing on many levels. The characters are complicated, but interesting, with heavy concerns weighing on their minds, which certainly gave me plenty to think about. The pacing is just a little slow at times, and the family drama occasionally took precedence over the investigation, but the threads all come together in the end, with a dramatic showdown that will hopefully be a wake-up call for those involved. This is a solid crime novel worth checking out, even if you have not been following the series. This story will appeal to anyone who enjoys mysteries or suspense thrillers. New York Times and USA Today bestselling author Allison Brennan believes that life is too short to be bored, so she had five children and writes three books a year. Allison has penned more than two dozen thrillers and many short stories. RT Book Reviews calls Allison “a master of suspense” and her books “haunting,” “mesmerizing,” “pulse-pounding” and “emotionally complex.” RT also said that "The Lucy Kincaid/Sean Rogan books are getting better and better!" 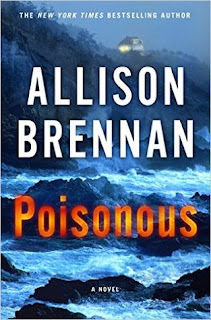 The third book of the Maxine Revere cold case mystery series, POISONOUS, will be out in April, 12, 2016. POISONOUS follows NOTORIOUS and COMPULSION. The 10th book in the Lucy Kincaid series, NO GOOD DEED, is out now. THE LOST GIRLS will be out in November, 2016. COLD SNAP, was a finalist for Best Thriller in the Thriller Awards (ITW) and FEAR NO EVIL won the Daphne du Maurier award. Allison has been nominated multiple times for RWA's Best Romantic Suspense award, and the Kiss of Death's Daphne award. Allison lives in Northern California with her husband, five children, and assorted pets.